As the response to my first guest Kulsum, with her delicious Lentil Stuffed Samosas, was so overwhelming, I am so happy to introduce you to my second guest in the India Series, the lovely Prerna. She brings one of our, especially Jonathan's, all time favorite snacks, the dosa. The talented Prerna a stay at home mom to a little toddler girl, has an excellent eye for photography and food styling. You might remember me singing her praises in my Spelt Challah Dough Rolls and Chocolate babka guest post I did not long ago on her Indian Simmer site. Although dosa is a south Indian specialty, I never made it before, but that is about to change thanks to Prerna soon! I remember moving to DC some 20 odd years back and finding this little place at The Old Post House Pavilion downtown on Pennsylvania Ave., literally a few paces, a short walk away from the White House, and it's still there. A super casual incy wincy counter called Indian Delight, at the bottom food court level of the pavillion with their reasonably priced, delicious dosas. We don't go as often as we used to when Jonathan was studying for his masters at Georgetown, but when we do, we relish every crispy bit of it with the spiced potato filling and green chutney for that extra bite. Shulie and I were talking a while back. It all started with a casual conversation and like with all the food lovers, it ended up being about food. I told her about my lack of ability to cook a beautiful loaf of bread and she empathized with me. She told me how her family, especially her better half, loves dosa and I shared how easy it is to make. The conversation went on and by the end of it somehow we were deciding on dates when we should share those recipes with each other. What better way to share a recipe with a food blogger than through the blogs. So for you fabulous readers and for a bit of our own selfish need we thought lets guest post on each other’s blog and share the recipes we both love so much. Last week Shulie came as a guest on my blog Indian Simmer to share her recipe of a perfect and ah so gorgeous Challah. Today she very generously invited me over to her space to share my recipe for a crisp, golden brown and comforting dosa. Thanks Shulie for the honor, I am stoked! For those who are not very familiar with dosa, it is an Indian style crepe or thin pancake. 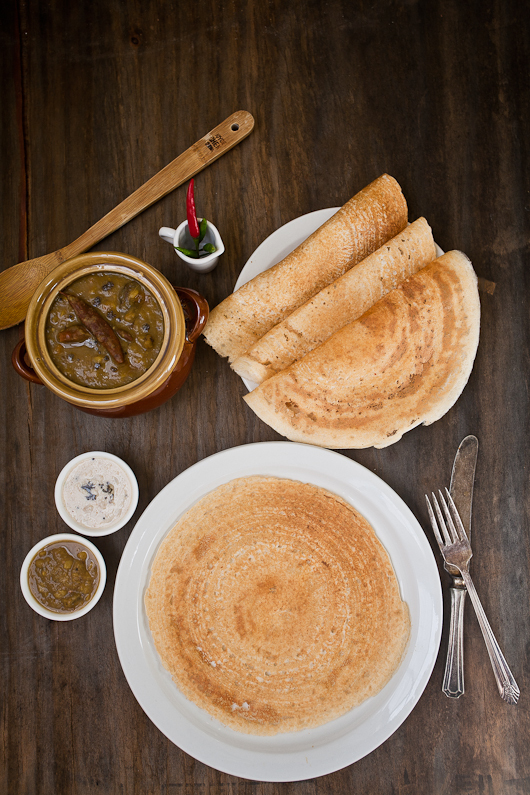 While in the north India roti or bread made usually with wheat is popular, dosa is a southern favorite. It is usually made by mixing rice and lentils in a particular ratio and then ground and fermented before making crepes out of it. I come from the northern part of India, the part where rotis are more of a staple than dosas. Although I do make dosas at home all the time but I wanted to learn more about them so I took a quick lesson from my friends Vijitha and Rose. Dosa is kind of their forte and they did teach me a lot about several varieties of dosas common in a South Indian family. 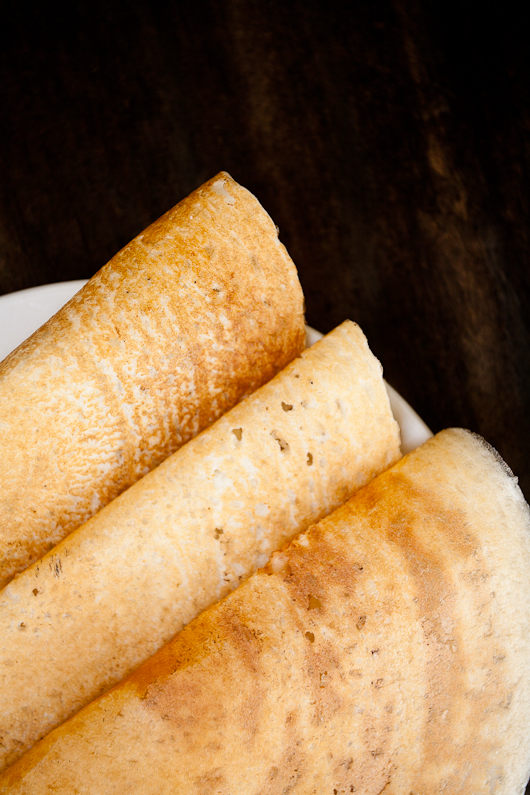 Some dosas are savory and some are sweet. Some are thicker and soft while others are thinner and crisp. They can be made with wheat flour, a lentil based batter, semolina based batter and what not. But to share with you here I decided to pick the kind that is most common and also popular. The kind you can find at any Indian restaurant and the kind that is made with a two simple ingredients - Rice and Urad dal (Split black gram). I have realized that making dosa is no rocket science! Just two main things to keep in mind – one, the ratio of rice and lentils must be accurate and second, fermentation has to be done carefully. Ratio between rice and urad dal for a dosa should be 3:1. Three parts parboiled rice and 1 part washed split black gram. The two are soaked separately in water for a few hours or overnight. Then the two are ground into a flowing batter later to be left to ferment in a warm dry place. Usually I let it ferment overnight, so technically getting a dosa batter ready to finally make the crepes takes at least 24 hours. But if you own an oven or enjoying some warm weather then you might be in luck and things might speed up a little for you! Look out for some little tips on how to make a crispy thin dosa which I have later discussed with you. But I have to add that everyone has their own little tricks for making dosas, these are mine and I am sharing because they work for me. If you have any other tricks up your sleeve feel free to share and educate us! ½ cup split urad dal (washed and soaked overnight) I use washed urad dal with no skin on. 2 tbsp semolina or poha (flattened rice) - Using this makes dosa crisper. Griddle, spatula, a wet grinder (to grind rice and lentils) - if you don’t have a wet grinder your blender should also work but with a wet grinder the batter is just smoother. 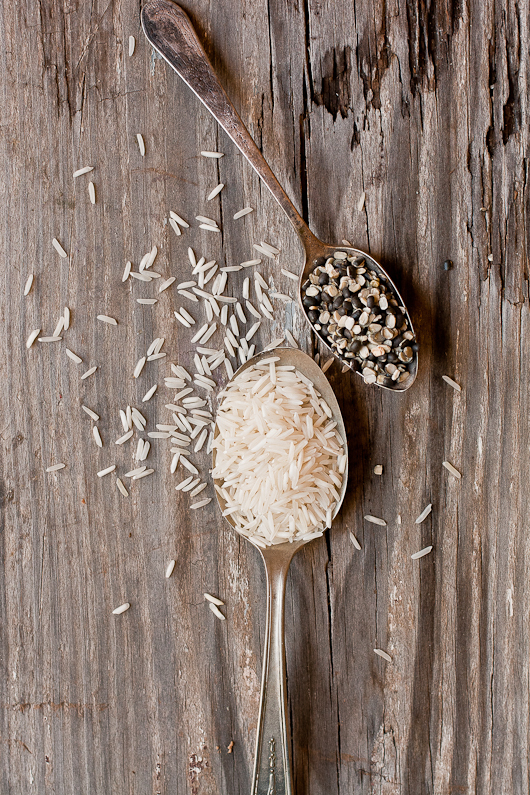 Soak rice and urad dal for at least 6 hours or overnight. Then grind them separately into a smooth flowing batter. Grinding the two separately and then mixing makes the batter lighter. It also helps in speeding up the fermentation process. Mix the two, add salt and cover the batter. Let it ferment overnight. The lid should be tight enough to trap the temperature inside but loose enough to let a little circulation of air. So don’t use an air tight container. Also the temperature should be somewhere around 80-85 deg. F for a proper fermentation. Heat a griddle. To test I sprinkle water on the griddle, if the water sizzles away right the moment then the griddle is hot enough. In a bowl, mix water and oil. ½ tbsp. oil to 2 cups of water. This water and oil mixture is used to clean and oil the pan after every dosa comes out of the griddle. Spray some oil on the pan. Dip a piece of cloth on the water oil mixture. Squeeze out extra water and then rub it over the pan to clean excess oil. Now pour a ladle of dosa batter. Starting from the center in an outward direction, swirl the ladle in a circular motion spreading the batter into a thin crepe. When the batter is spread, after a few seconds (8-10) it will start getting dry, spray or sprinkle oil on the dosa. Give it a few more seconds and the bottom of your dosa will start getting darker and golden brown in color. This means your dosa is almost ready. At this point if you want to add any filling in your dosa, you can place it in the center and fold the two sides, one over the other. The filling can be a simple potato filling or vegetables or even minced/cooked meat. 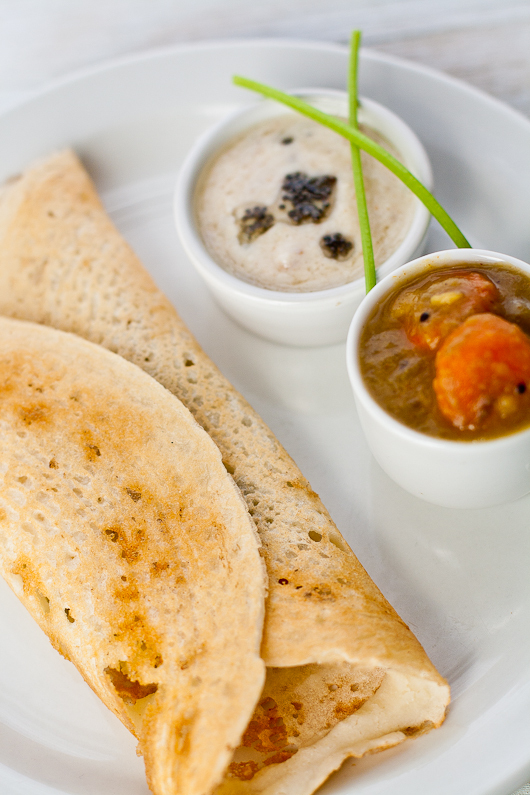 Traditionally dosa is served with sambhar (lentil soup cooked with vegetables) or spicy coconut chutney. I loveeee dosas .. it is made at my house at least once every fortnight. served with coconut chutney and sambhar .. sometimes stuffed with potatoes too. Prerna - Your dosas look perfect. Beautiful dosas and pictures! I love Prerna's magnificent blog. Thanks for the great guest post. these pictures are beautiful! and i love crepes, so i'm sure i would love these dosas! i love that is a complete protein too! Prerna is a talented food photographer as I always love her shots! Ahh I just realized I haven't been talking with both of you for a while. How are you Shullie and Prerna? Awesome pictures! A small time hotelier at the end of our street in my native place (who by the way makes the crispiest dosas) adds a handful of toor dal and 2 tsp fenugreek seeds to the mix!! Hmmm, those dosas look delicious! They do look very crispy...yum! Yet another stellar recipe from Prerna, who I adore oh so much! And thank you for sharing her with us, Shulie. You know I love and adore you as well. Great pictures and perfect looking Dosa. For making perfect Dosa griddle type matters. Use well seasoned cast iron or hard anodized griddle for best crispy results and handling. In recipe you ask for parboiled rice, picture showed Basmati rice.Also skinon urad dal is shown but for making dosa batter skinless urad dal is used. Why no chutney or sambar recipe? It would have perfectly squared this post for international readers. Shulie, I love this series! As you already know, Indian food is a favorite of ours. Thank you for having Prerna over! Absolutely stunning....I love the pictures and this looks SO good! Gorgeous dosas! My boyfriend is South Indian and I'm incredibly spoiled by the AMAZING dosas I have every time I visit his family. I've tried to make them myself but they have never turned out quite as well as him mom's or grandma's. But your's look perfect. Beautiful pictures. Shulie, I'm new to your blog, but I've loved everything I've read so far! This series has been wonderful. Those are beautiful, beautiful dosas. Glad you two ended up having that casual conversation that turned into guesting on each other's blogs! They are perfect Prerna and Shulie! Thanks for the mention even tho I had only tips on the instant wheat dosa to give, since even tho being Southie I haven't dared making the rice batter myself! Whole wheat buttermilk dosas ( Moru dosa) are also popular in the South and really easy to make, no need to grind the batter or wait for it to ferment. Thank you all for your lovely comments.Having so much fun having Prerna here as a guest. For those of us dosa lovers who never made it before, lets! For those of you with the great addtional tips and links, thanks! For those of you that are unfamiliar please do try, the flavors are universal. I should also add that fermented foods are super healthy but it's past midnight and I would like to leave a more educated comment on the subject when I am not tired. Have a great weekend everyone and welcome for those of you who are new to this space! Thank You Thank You Thank You everyone! I am humbled with all your feedback and really appreciate your input. This is how we learn and teach something to each other right?! Thanks Shulie for the opportunity. It has really been an honor guest posting here on you fabulous blog! Came upon ur super cool blog via Prerna`s (another super awesome blog!! )..Beautiful cliks, new recipes etc etc u have here..Happy to follow u!!! I have never eaten dosas and now I really want to. Prerna is so talented (and so are you darling Shulie:) This is a wonderful and delicious guest post. Happy Weekend to you both! Thank you for this recipe. As a Brit I LOVE Indian food, but sadly our town does not have the best restaurants. Prerna has done a wonderful job here as always! the photographs are gorgeous and Shulie it is always wonderful to see 2 good friends in one post! Those Dosa's looks perfect! Dosa's are my favorite and I'm glad you bought a bit of South Indian food to the table Shulie. Its a great cuisine by itself. Love Prerna Love you! I always have one of the huge dosas in Sankalp (sp?) when we visit friends there, love them. And now you'll give me the courage to try for myself! Shulie and Perna, what a great post with fabulous photos! I lived in Bangalore for a year and one of the restaurants in the tech park our office was located in had a restaurant -- kind of cafeteria style -- that had the BEST Tandoori Chicken Dosa and a pani puri (I think that's what it was called) stand. I have successfully recreated the dosa -- as well as I can remember, but I have done it the cheating way -- with a box of dosa mix. It's very easy, but I like making things from scratch, so I am going to use your recipe and give it a go. How fun! Maybe one day I'll give pani puri a try. Looks so difficult. Your dosa's look picture perfect! Can you please explain how/when to curl dosas into a shape? An outstanding share! I've just forwarded this onto a colleague who had been doing a little research on this. And he actually ordered me breakfast due to the fact that I discovered it for him... lol. So let me reword this.... Thank YOU for the meal!! But yeah, thanks for spending the time to talk about this matter here on your web page. I am no longer positive the place you're getting your information, but good topic. I must spend some time learning more or figuring out more. Thank you for magnificent information I was searching for this information for my mission. this regard, thank you for sharing. . . .
know I am getting knowledge everyday by reading thes pleasant articles or reviews.